CES 2012 was a bust for the most part. There were a couple of highlights, but we walked out of there shrugging our shoulders at the lack of big announcements. Mobile World Congress on the other hand, even without the Galaxy SIII, is not going to be a bust. NVIDIA’s press invite should tell you all you need to know about the tech world’s next big conference: Tegra 3 quad-core phones. While it may not specifically say “phones,” the picture is clear. 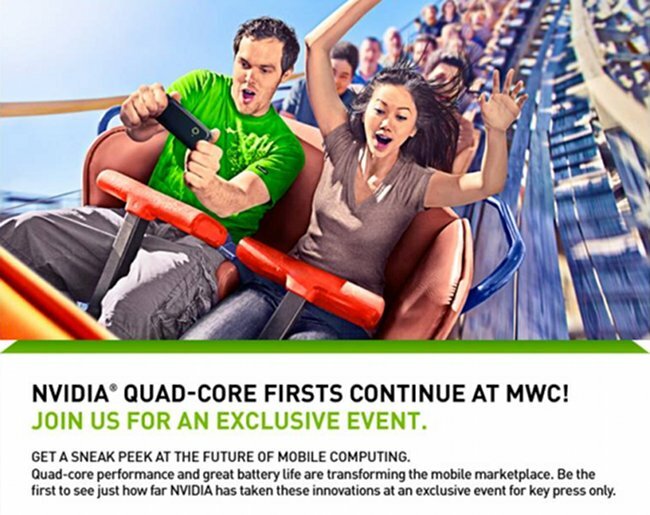 The guy at the front of the rollercoaster wearing NVIDIA green is holding a smartphone. And since we have seen quad-core tablets already, the smartphone world is ready to have their party. “Great” battery life and PC-like performance is about to be in your pocket on a daily basis. LG, HTC, and Fujitsu are all expected to be in attendance. Are you all ready for it?